A large palm with a trunk up to two feet across. Leaves are yellow/green and palmate with spiny stems. Leaves have numerous threads hanging between the leaf segments. If not pruned off, dead leaves persist almost indefinitely. Native habitat: Native to desert oases in southern California and the native palm of Palm Springs. Commonly planted in California and Florida. Size: Can get very large. In warm climates plants can grow up to 100 feet tall. Very fast growing. Cold hardiness: The true cold-hardiness of this plant is a matter of considerable debate. In areas that have fairly cold but dry winters, the Mexican Fan Palm is reported to tolerate weather down to zero degrees or lower. 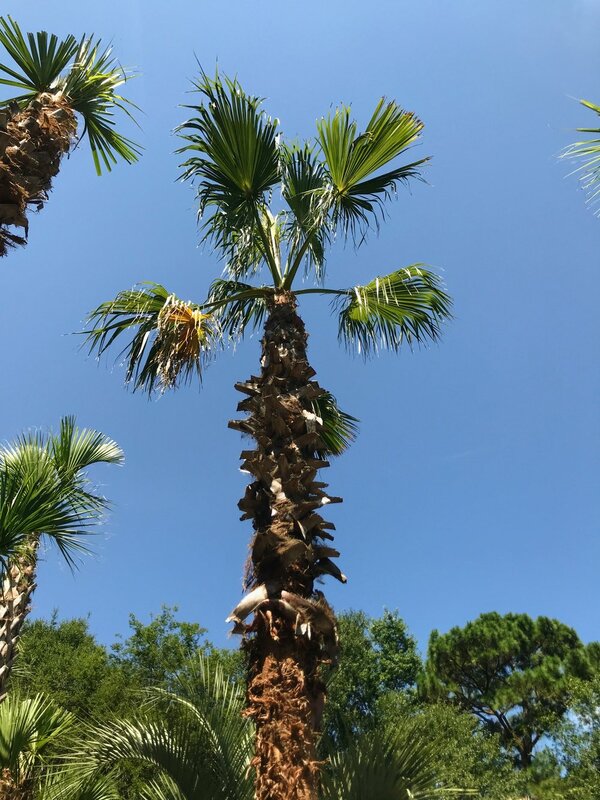 In the Southeast, the Mexican Fan Palm seems to suffer some leaf damage at temperatures less than 20 degrees; rapid recovery with spring temperatures. Planting in fast-draining soil enhances cold-hardiness. Landscape use: The large size and fast growth rate demand careful placement. Moderate salt tolerance.